The BecTri is a Sprint Triathlon, consisting of a 400m swim in the beautiful high-altitude Nottingham Lake, a 15K road bike, followed by a fast 5K run on paved recreation paths. The 2018 BecTri Sprint Triathlon starts in Harry A. Nottingham Park in Avon, Colorado with a 400m swim. Wet suits are not required, but are recommended. Transition from your bike and finish with a fast 5K run or walk that leaves Nottingham Park to the Southeast along Riverfront Lane to the recreation path. 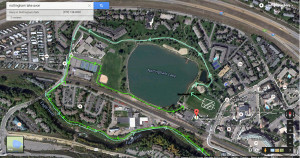 Runners then head west along the river to Beaver Creek Blvd and back to the park. 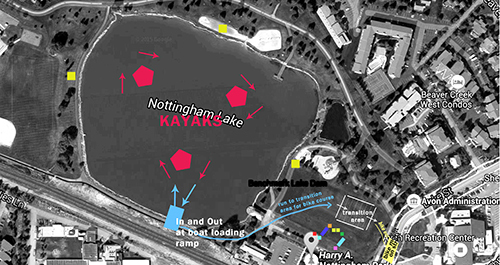 The run course map is pictured below. Finish in the park while friends and family cheer you along. 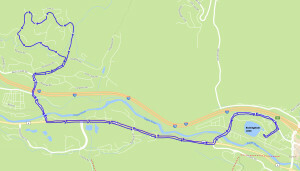 The 5K walk/run will follow the same route as the 5K triathlon course above. The 5K begins at 8:30 am.